From Goodreads ~ From his earliest public appearances as a mischievous redheaded toddler, Prince Harry has captured the hearts of royal enthusiasts around the world. In "Harry", Britain's leading expert on the young royals offers an in-depth look at the wayward prince turned national treasure. Nicholl sheds new light on growing up royal, Harry's relationship with his mother, his troubled youth and early adulthood, and how his military service in Afghanistan inspired him to create his legacy, the Invictus Games. "Harry: Life, Loss, and Love" features interviews with friends, those who have worked with the prince, and former Palace aides. Nicholl explores Harry's relationship with his family, in particular, the Queen, his father, stepmother and brother, and reveals his secret "second family" in Botswana. She uncovers new information about his former girlfriends and chronicles his romance and engagement to American actress Meghan Markle. "Harry" is a compelling portrait of one of the most popular members of the royal family, and reveals the inside story of the most intriguing royal romance in a decade. Everyone knows who Prince Harry is ... grandson of Queen Elizabeth, son of Prince Charles and the late Diana, Princess of Wales, and brother of Prince William. 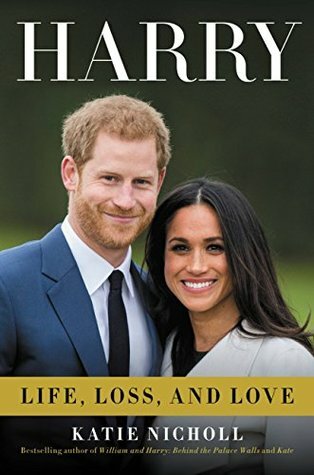 This book is all about Prince Harry, starting with his birth (actually a bit before his birth), growing up with divorced parents, the death of his mother (and finally dealing with the grief later in life), his military career, his love life, his partying, his charities and ending with his engagement to Meghan Markle. I found it to be an interesting read. There was just enough information without having too much detail. There were quotes and stories from people close to the prince, his family and friends, and Meghan's family and friends, but also from anonymous sources (those I always take with a grain of salt). It was interesting to get a peek inside how the Royals live, what is expected of them, etc. At the end, there are lots of colour pictures of Prince Harry over the years. If you are interested in the Royals, especially the younger ones, you will probably enjoy this book.